In early June, the Northborough-Southborough youth lacrosse program was given the chance to put its U-11 team out on the field for an eight-minute contest at halftime of a Boston Cannons game. And the significance wasn't just in the kids getting to run on the hallowed grounds of Harvard Stadium. It was that, for the fourth straight year, the program was able to bring a large enough group to the game to be afforded that chance. Over 300 people associated with NSYLA attended. President Bob Flynn spearheaded the effort and, to those in attendance, the event again encapsulated the tight-knit culture around the growing sport when Boston star Mike Powell stuck around well after the game to hang out with the kids. "He was the last player to leave, and he got all the kids autographs," said former Algonquin coach Dave Roche, the program's vice president. "It's amazing to me, not because he was signing, but because these guys realize they are role models. They recognize the kids as much as much as the kids recognize them. And the kids eat it up." There certainly were a lot of them. The NSYLA now fields eight teams from the U-11 to U-15 levels, with more than 200 kids in that group, and another 25 at the U-9 level. This group isn't alone either. Roche reports that the Eastern Mass. chapter of U.S. Lacrosse is now the country's largest, and the timing couldn't be better for that development. Next spring, Gillette Stadium will host the college Final Four, an event that's drawn crowds of better than 50,000 a day the last two years in Philadelphia and Baltimore, respectively. Los Angeles closed the half with two goals and Boston lead 11-8 heading into the locker room. During halftime two youth teams took the field to play on historic Harvard Stadium field in front of the large crowd. For the fourth straight year, the local Northborough-Southborough Youth Lacrosse Association sent a large entourage to root for the Cannons, and also to enjoy the halftime game played by the Under 11 year old Tomahawks against a team from East Bay Rhode Island. The eight minute halftime game before the record crowd ended in a 1-1 tie, with several thrilling plays that had the fans cheering wildly. The Northborough-Southborough program had 300 people in our group, proudly supporting the youngest professional franchise in Boston. Information on NSYLA Night at the Cannons! Our U11 team will play on this field! Northborough-Southborough Night at the Cannons! Special Event – NSYLA U11 Players will play on the field during halftime against a team from East Bay, RI! In answer to a question, we have a block of 100 tickets all together, so do not worry if you appear to be 8 rows from who you want to sit with, NSYLA will be in one big group pretty much occupying the whole section. In the last three years we have had 550 Parents and Players at this event, and ask any one of them, it is a very exciting night! 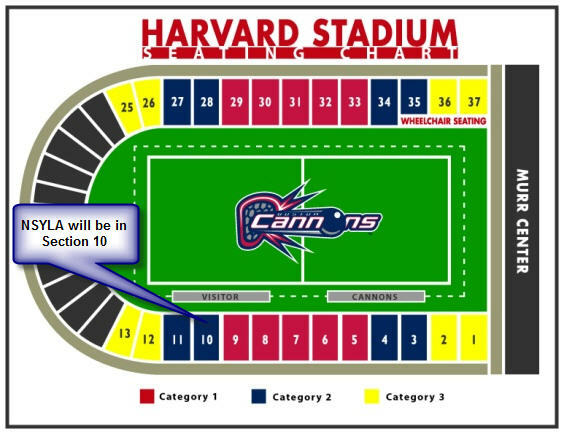 Our program has already purchased 100 tickets together to the Boston Cannons professional lacrosse game for Saturday June 2nd and they will go fast. Don’t be left out. The game is against the Los Angeles Riptide. If you have never seen pro lacrosse you will be amazed. Because NSYLA has purchased a large block of tickets, the Cannons are going to let us play a brief game on the field during halftime. 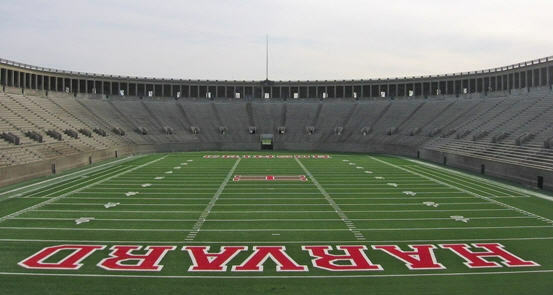 The game will be at the Harvard University Football Stadium! The game will be played by a combined team from the U11’s who can make it. Coach Roche and Coach Sullivan will put the roster together. We really think that Mom’s and Dad’s would enjoy this family event, so if your son wants to attend we would love for you to come also. Why not bring the entire family! This is the fourth time our program (NSYLA) is doing this, so we appreciate your support. This will be a great family night out. Who are the Boston Cannons you ask? The Boston Cannons are the lacrosse equivalent to our own Red Sox or Patriots! These are professional lacrosse players, the very best in the world. Come join us for the fastest game on two feet! All fans enter through Gate 6 off of North Harvard Street. Take the Massachusetts Turnpike east to Exit 18 (Allston/Cambridge). After paying toll, bear left at fork towards Allston. Turn right at second set of lights onto North Harvard Street. Proceed approximately one mile. The following facilities will be on your left: Harvard Stadium, Bright Hockey Center, Blodgett Pool, Palmer Dixon Tennis Courts, Beren Tennis Center, Gordon Track, Cumnock Field, Jordan Field, O'Donnell Field, and the softball field. Ohiri Field, used for soccer, will be on your right. For football, men's ice hockey, and men's basketball, you must have a Gate 6 parking pass to enter at this location. Public parking is available for football at Gate 14, which is accessible from Soldiers Field Road. Harvard University is a great place to tailgate before a Cannons Game. However, tailgating rules are strictly enforced! Video Cameras and Camcorders are not allowed. We have 300 seats in sections 10 & 11 now! Boston Cannons Season Tickets are still available! Season Tickets are $108 per seat for 6 unbelievable nights of lacrosse, played by the best players in the world. This upcoming season promises to be the best yet, with Mikey Powell coming to Boston and the Cannons move to Harvard Stadium; don’t miss out. Tickets can be purchased by calling the Cannons office at 617-746-9933; once you place your order, you will be given your seats over the phone so there will be no waiting! We look forward to seeing you this season, Go Cannons!